Tips For An Online Launch Party! I find setting it over lunchtime is most successful, that way people in work can pop in during their lunchtime - mine was from 11am to 2pm. Also, unless you have lots of giveaways and subjects to discuss, setting it for many hours means it can end up being very quiet. Prepare lots of fun photos to upload eg of booze for the guests, savoury snacks, cake, handsome guests - then in between competitions you have plenty to discuss, eg what is your guests' favourite sweet nibble or tipple. Make sure there is going to be plenty going on - I set one competition each hour, and make the entry question easy for lots of people to participate. My book, From Paris with Love has the themes of France, food, spies and rockstars, so I set the questions around those themes, but in a general way, eg, what is the best meal you have ever eaten out? Then, I would pick a winner out of a hat (or beret!) from everyone who left a comment. If you make the questions more specific, eg related to the book or its prequel (if it has one) you risk alienating people who are new to you as an author - they won't be able to take part. Have decent prizes - they needn't be too expensive. 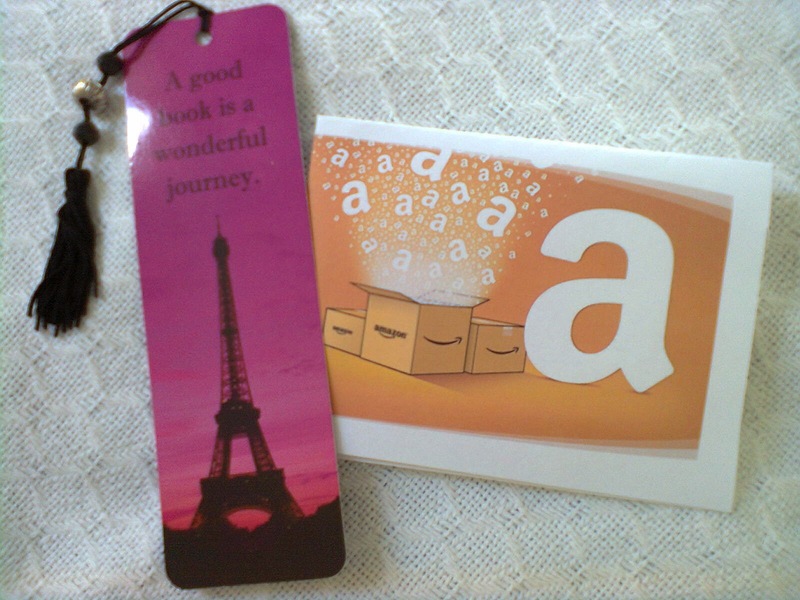 Mine were gifts related to Paris, eg a bookmark and notebook, plus an Amazon voucher is always a good prize to fall back on. Make it fun! And most importantly, acknowledge every single comment - if people have given up their valuable time to participate, that is the least you owe them. Enjoy it! Online launch parties, especially for us e-authors, can make your day very, very special. Finally it's arrived, the day I've been waiting for - the publication of my second novel, From Paris with Love. It follows the relationship of bonkers Gemma and Lord Edward, from Doubting Abbey, as they spend a month in Paris - although this book can be read as a standalone. I'll be touring some lovely blogs over the next two weeks and if you buy the book, I do hope you enjoy it. Some wonderful 4* and 5* reviews have already rolled in on Amazon and GoodReads. Right, better go and get ready for my Facebook launch party - do come along if you can. 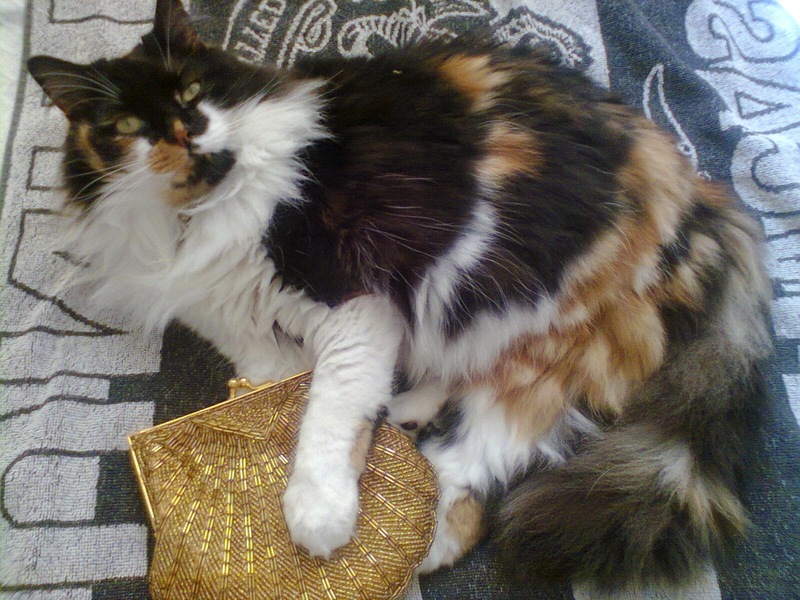 My gorgeous (and knows it) female cat Mitzie has already packed her clutch bag :). From Paris with Love is available to buy from UK and US Amazon and other good e-book retailers. This Thursday 24th July sees the launch of my second novel From Paris with Love - just in case I haven't mentioned it before (which, um, is highly unlikely!) Below are photos of the prizes for three competitions I shall be running. There's a £10 Amazon voucher up for grabs, which would cover the cost of my book, plus leave change for another purchase! 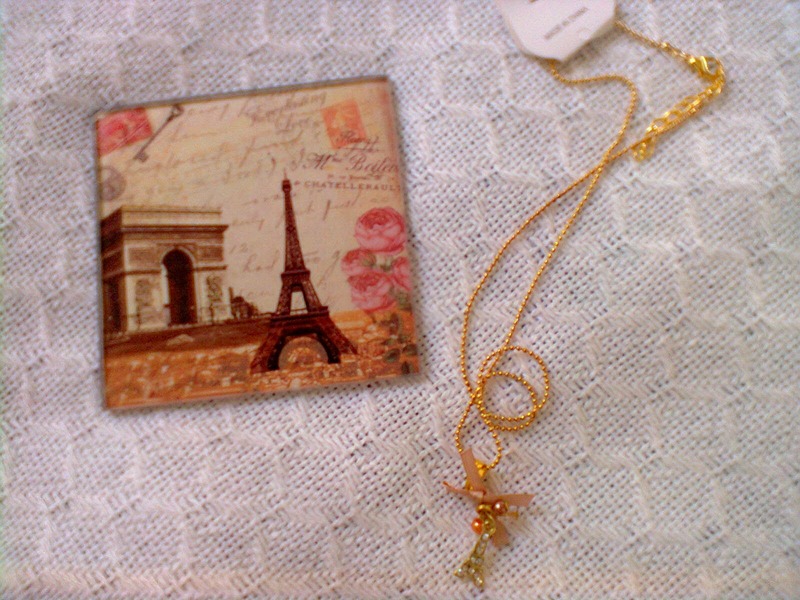 Plus a fancy Paris bookmark, and a cute Eiffel Tower necklace. 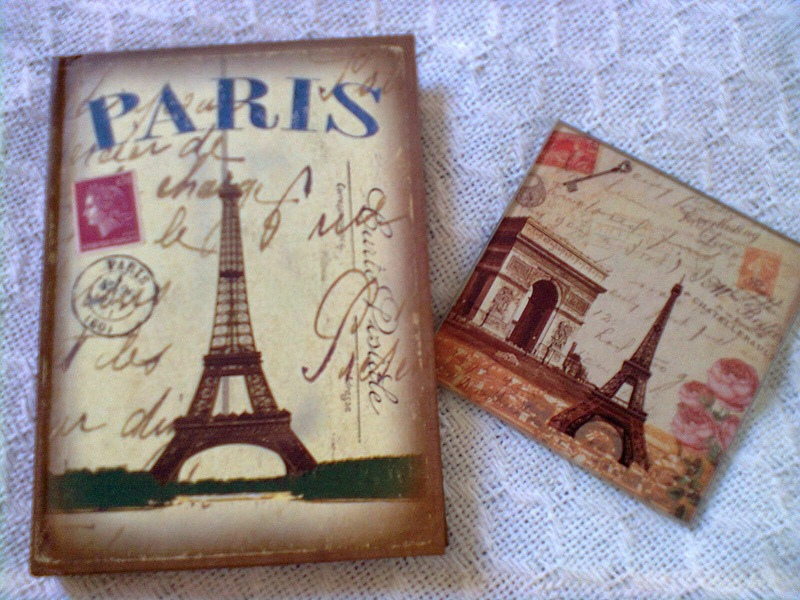 Also vintage Paris themed coasters and a fab notebook. Finally July has arrived and it is precisely 19 days until my second novel, From Paris with Love, is published - squee! Hence me sitting in front of a computer on a Saturday, whilst the sun is shining - I am writing guest blogs for my tour and picking out some lovely prizes for my Facebook launch party on 24th July. Please, do come along and join in the fun! 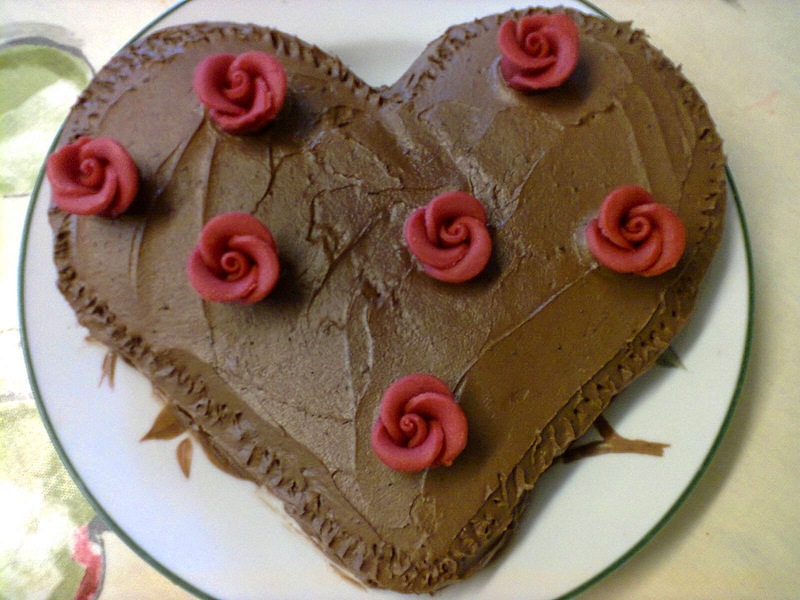 There will be plenty of virtual cake and fizz. Or, visit one of the stops on my blog tour, where I'll be listing the best and worst things about being published and talking about the fact that I'm a little bit bonkers, like my main character, Gemma Goodwin. My blog tour will begin on the 22nd July with three blogs posting the first chapter of From Paris with Love. It will run until the 6th of August, by which time I'll have eaten my weight in chocolate. I can't wait for you to follow Gemma's antics once more. Plus meet mystery stalker Joe Bloggs and hot rockstar Blade who makes her laugh. And, of course, loyal, gorgeous Lord Edward is also in the French capital. In fact he's become friends with an annoyingly attractive, snooty local called Monique. Watch the sparks fly between her and Gemma!